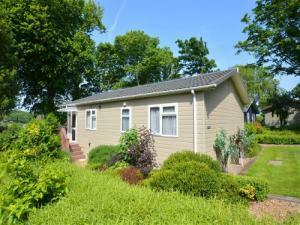 Avocet Lodge01263 715779work01603 870304fax Self-cateringA modern holiday home set in parkland, the surrounding communal grounds have a stream, waterfall and views from the lodge itself stretch out across farmland to the Norfolk Coastal Path, less than a quarter of a mile away. The lodge has a step-up-to decking area outside with table and chairs and makes a lovely relaxing spot. The property is well appointed with an open plan living/dining/kitchen area, two bedrooms and a bathroom. Weybourne is a small north Norfolk village in an Area of Outstanding Natural Beauty and is also close to the popular resort of Sheringham. There is plenty to do with fishing, golf, tennis, birdwatching and walking close by. Visit beaches and woodlands and don't forget the charming town of Holt with art galleries, cafes, boutiques and restaurants. A modern holiday home set in parkland, the surrounding communal grounds have a stream, waterfall and views from the lodge itself stretch out across farmland to the Norfolk Coastal Path, less than a quarter of a mile away. The lodge has a step-up-to decking area outside with table and chairs and makes a lovely relaxing spot. The property is well appointed with an open plan living/dining/kitchen area, two bedrooms and a bathroom. Weybourne is a small north Norfolk village in an Area of Outstanding Natural Beauty and is also close to the popular resort of Sheringham. There is plenty to do with fishing, golf, tennis, birdwatching and walking close by. Visit beaches and woodlands and don't forget the charming town of Holt with art galleries, cafes, boutiques and restaurants.